Would you believe us if we told you that making sushi at home is easier than you’d think? We thought not, but hopefully, these tips and tricks will be able to prove that impressing your friends in the kitchen doesn’t have to be as hard as we once thought. Of course, we need the right seaweed to get started on our journey to become culinary geniuses. You need to make sure you choose one that is nice and thick, and one that has been designed to use as a roll if you want to get the most out of your creations. If it’s too flimsy, then you might find it falls apart as you create your meal. Many people will tell you the only way to roll sushi is by using a bamboo mat. While they can be a great investment for those looking to craft some every day of the week, not everyone wants to fork out on the extra cost. 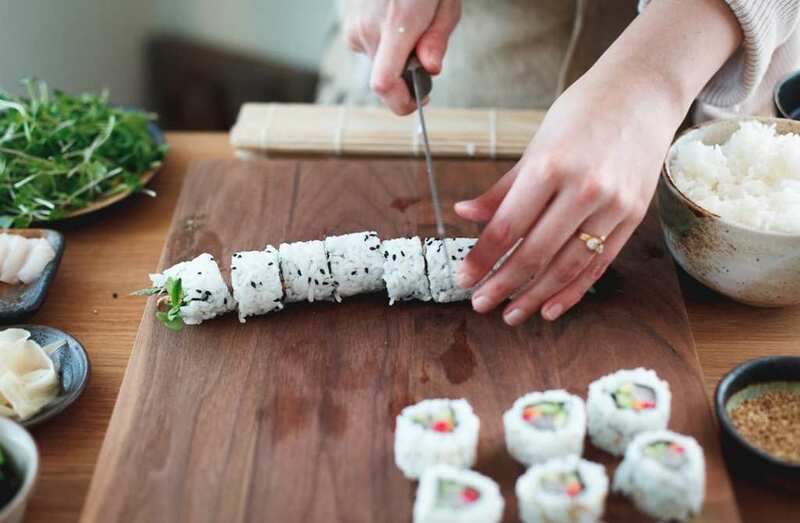 A towel, plastic wrap, and parchment paper can be perfect stand-ins, while special sushi rolling device can also be a great investment if you want an extra bit of help. The next step is to layer the seaweed with your rice. It’s vital to ensure you have an even layer across the entire sheet if you want to make sure your sushi rolls with ease. Some stores sell special sushi rice that is perfect for the job. If not, be sure to choose a grain that is nice and sticky to make it easier to prepare your rolls later down the line. If you like, now is also the time to add in the cream cheese. Now comes the fun part – getting to choose all those delicious fillings! The best part about sushi is you don’t have to worry about cooking any of the ingredients. Instead, all you need to do is choose what flavors you think will work well. Many opt for fish, while others keep it entirely vegetarian with options such as peppers, carrots, and cucumber instead. Whatever you decide, it’s vital to cut them into long, thing stips, and to place them lengthways in the center of the wrap. At last, it’s time to roll up your creation. To start, place your thumbs underneath your mat and lift the mat/seaweed/rice selection over the fillings laid down the middle of the roll. It’s then time to use the rest of your fingers to ensure you get a nice tight seal against the ingredients. Continue to roll your sushi up without getting the mat caught until you have a delicious tube of the stuff. Finally, you just need to cut it into bitesize chunks ready to serve! See, we told you that making sushi at home is easier than you’d think. The best part of it all is you can now sit back and enjoy your exotic yet delicious creation in peace. Perfect.